SCS (formerly 3M) Field Service Vacuum (Model 497AB) is the service engineer's choice for efficient cleanup. Portability, quick setup, and efficient, safe operation are key features of this powerful vacuum. 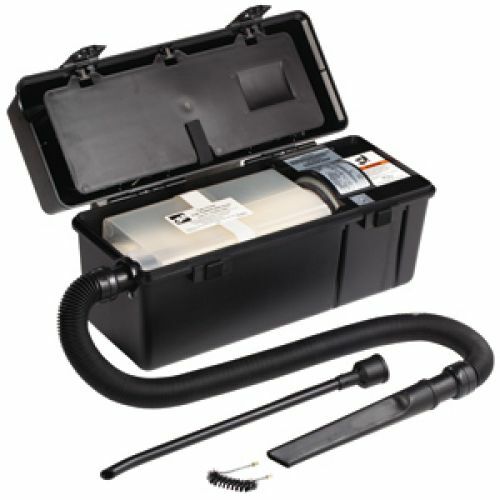 The power cord, stretch hose, and all other attachments fit easily into the cover compartment for rapid access. The extendible hose allows the operator to clean large machines and hard-to-reach areas without lifting the vacuum. Katun by SCS's technologically advanced vacuum materials dissipate electrostatic buildup, reducing the risk of shock damage to sensitive electronic equipment and protecting the service technician from electrostatic discharge. The 1 HP motor is continuous duty rated with one sealed ball bearing and one sleeve bearing lubricated for life. Thermally protected with automatic reset. Comes complete with Type 2 filter, detachable power cord, 32 inch stretch hose, crevice brush and nozzle, and curved wand nozzle.